Every Wednesday evening six Chinese girls came to my apartment. By the middle of the Spring 2010 term at Xiangnan University in the home province of Uncle Mao and General Tso, I had come to depend on them to keep me happy. 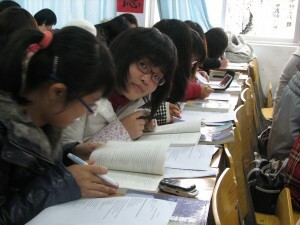 They were junior English majors and picked English names like Tina, Victoria, Christie, Helen, Cherries, Emilia, and Emma. Without their attention, kindness, and passion, I surely would have gone crazy as is so much the fate of many foreigners who come to China looking for love or a new life. But I am getting ahead of myself. It was a dismal cold day in March when I met with the vice dean of the English Department. A frigid mist blanketed the campus. The college itself clung to the sides of a green karst peak. 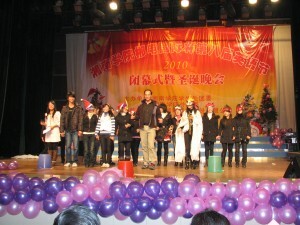 It was the day before the official start of the Spring 2010 term. Students were still arriving from holidays spent with their families in the countryside and the cities. And I had just returned from a tour through Yunnan, Laos, and Vietnam to prove to myself that a nuclear winter had not in fact descended upon the heartland of China, and that this information had somehow been censored by the government in order to a maintain its grip on social harmony. The vice dean, a short well spoken Chinese gentlemen with a Mr. Clean sheen on his bald head, told me that I would not be teaching the junior English majors Literature this year, and instead would just teach Oral English to the freshmen. Though I had received glowing reviews from a handful of students who appreciated my efforts to cultivate creativity, free thought and critical thinking in a culture based on rote-learning, conformity and obedience to authority, a majority of students were not impressed with my western pedagogy. In their eyes I was just a foreigner teaching in a manner foreign to them. I was an obstruction. They wanted me to teach literature as a history class to prepare them for an exam they would have to take after they graduated. They wanted answers to multiple choice questions and fill-in-the-blanks. And they were not impressed when I told them that literature as in life cannot be neatly defined by simple answers, that life is not a multiple choice exam. Let’s just say I don’t like to give it up so easily. By the middle of last term, I had compromised and gave them lessons that offered the best of both civilizations: stuff to count and memorize (i.e. what are some symbols in <em>The Great Gatsby</em>? Describe the structure of a sonnet, etc. ), stuff to talk about (What do you think Hamlet means when he says, “To be, or not to be?”), and image laden PowerPoints about the life and times of particular writers (correlated with dates in Chinese history). But in the end, there was nothing I can say or do to persuade the vice dean to let me teach what I had come to China to teach. It did not matter that the one reason I chose employment in this third world city (students often asked me with incredulity why I came here of all places, some having surmised that was trying to hide from a checkered past) over one of the “Chinese Ivy League” schools located in one of the more first world touristy cities was that Xiangnan University was the only one that promised me a position as a literature teacher. I was beginning to suspect that vice dean had taken a bribe. Some students clapped and cheered when I announced I would not be teaching them for the spring term. Instead they would be dropped into a supersized class taught by a Chinese teacher. I told them they could at least pretend to be disappointed. But I could see their perspective – this is what happens why you actually read too much literature: you begin to see and feel the world through the eyes of others, a point I had hoped to indoctrinate them in the second term, along with a unit on gothic literature, vampirism, and Marxist criticism). After all, a large class size had the advantage of allowing any student to get away with murder: you can sleep, listen to your MP3 player, text message your heart out, do homework, and plan your song list for a night out at the karaoke bar while tuning out the Chinese teacher informing the class in Chinese about the family tree of Elizabeth I or James I (as opposed to me asking questions about Hamlet’s soliloquy, and then letting an awkward silence fall upon them as I waited for someone to find enough courage to say something, anything in English). So that was the death of English Literature. But I did not let this deter me. I had a plan to bring my class back to life. This time I would only use the most brilliant minds I could find. I had taught five literature classes. Each class had about 2-5 students out of 40 who participated fully. The rest either skipped class, zoned out, or dutifully attended class on the offhand chance I would call roll. Another portion of the class was either just too shy or lacking in confidence to speak out. Out of these classes, one class in particular outshone all the others. It was this class, Class 2, that I harvested the souls of six students to join my underground literature class. And that is how I came to find myself surrounded by six Chinese girls who came to my apartment every Wednesday evening to share my love for literature.